Apache is staple web server for production environments, but it is hardly easiest thing to set up or tweak. 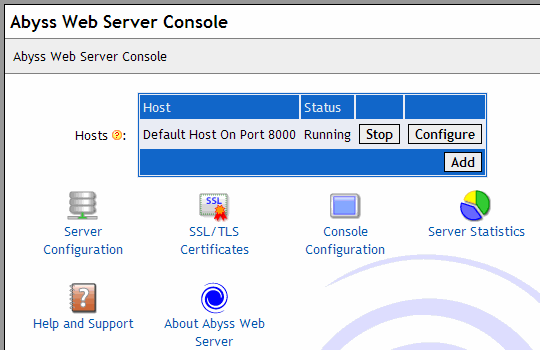 Abyss X1 is compact cross-platform web server that it easy to install and with all setting managed through convenient web console. As any web server at client’s side it just stays out of the way to serve static and dynamic files through HTTP. At admin’s side app comes in small download, fast to install and is completely managed through web interface. Abyss isn’t outright portable but it does keep setting contained. Configuration file can be edited to use relative paths to make it completely portable. So far only minor issue I encountered is lack of limit to log files sizes. While I was setting things up last time one script was generating a lot of errors and log managed to explode over 100MB rather quickly. Abyss supports CGI. FastCGI and ISAPI so it will work with numerous scripting languages. Including (but not limited to) PHP, Perl, Python, ASP and Ruby. Documentation includes detailed instructions on set up for common languages. For some there are also pre-configured packages, but versions are not kept up to date. It is probably best to get latest from language’s home page and go through its setup instructions as well. Very robust and easy to set up server for personal or intranet use. Might be fit (and is for some) to run public site as well, but that niche is packed much more full.